The Kaziranga National Park (a World Heritage Site) and the Nameri National Park (also a Project Tiger Reserve) are two of the best nature reserves for wildlife and birding enthusiasts in North Eastern India. We are introducing Walking Safaris to these two National Parks for the first time to enhance our guests’ wildlife experience and to offer a closer interaction with nature as well as the local culture. During our Walking Safaris our guests will visit many tourist-free areas of the Parks where wilderness experience is at its very best. Though the main theme of this wildlife tour is walking safaris inside nature reserves, the program also includes the fun of the jeep safaris on designated routes and elephant rides in Kaziranga National Park, rafting on the serene Jia Bhoreli River flowing through the Nameri National Park, drive through the plains of rural Assam and visits to tribal villages. While we enjoy luxurious stay at the beautiful Diphlu River Lodge, we will also stay at a modest jungle camp in Nameri National Park. Our fixed departure, small group Walking Safaris operates from November to March when the weather is comfortable and National Parks are at its best, especially with the arrival of the migratory birds from as far as Siberia. 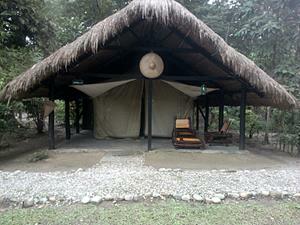 All our safaris are accompanied by knowledgeable local naturalists, Forest Rangers and English speaking escorts. Situated on the banks of a small river that forms the southern boundary of the National Park, the Diphlu River Lodge overlooks the park. Guests have the extraordinary experience of spotting water birds, and with some luck, rhinos, wild buffalo's and elephants, from the comfortable reclining chairs on the verandah of the main restaurant building called the Machaan, meaning watch tower in Hindi. The Lodge offers luxury facilities with its air-conditioned cottages on stilts, undoubtedly the best experience in Kaziranga. All cottages have been beautifully designed to make full use of local materials and artefacts and blend in with the stunning natural surroundings. All cottages are well-appointed and charmingly furnished with individual interiors and en-suite bathrooms. The grounds of the lodge have been carefully planned to preserve the natural environment. The food at the Lodge is a pleasant mix of continental, North Indian and Assamese cuisine made with fresh, locally produced ingredients whenever possible. The Diphlu River Lodge , has been judged the first runners up in Best Wildlife Resorts of India category by the Lonely Planet Magazine’s Travel Awards 2013 (May edition).The second runners up award of the Lonely Planet has been bagged by Mahua Kothi of the Taj Group at Bandavgarh in Madhya Pradesh and the winner is The Oberoi Vanya Vilas at Ranthambore. Kaziranga National Park is the most well known wildlife park in Assam and every Assamese is proud of it. This park is home to some of the most fascinating wildlife in Asia including the famed Greater Indian One-horned Rhinoceros. The moist deciduous forests of Kaziranga is a birding paradise with a check list of almost 500 species which includes Green-backed Heron, White bellied Heron (rare), Lesser and greater Adjutants, Spoonbill, Grey-headed and Pallas's Fish-eagle (common), Swamp Francolin (common), Grey-headed Lapwing, Black-bellied tern, Marsh Babbler, Jordan's Bush chat (rare) White-throated Bush chat and many more. Apart from the Rhino, other species found are hog deer, swamp deer, wild buffalo, elephants and if you are lucky, the tiger. It is virtually a paradise for bird watchers, with a variety of migratory and resident birds. It is also home to pelicans, storks and darters as there are a number of water bodies inside the Park. Early morning go for another elephant ride inside the park. After breakfast you will be transferred to Nameri National Park. Check into your tents. After lunch at the camp, we set out on foot to discover a picturesque Mishing village nearby. In the evening blend in to the music and dance performance by a tribal troupe in the camp. Dinner and overnight in the camp. We will leave our camps early in the morning, board a paddle boat that will take you to the other side of River Jia Bhorelli. Disembark to take a short walk to the Potasali forest camp. Breakfast at the camp. After breakfast we will carry on for a jungle walk stopping at a couple of watch towers. This trek generally takes 2 hours but we are flexible to extend it depending upon your interest in bird-watching. Return to the forest camp for lunch. Later resume walk (approx 1 hour, longer for avid birdwatchers) from Potasali Camp to Oubari Camp and Moniram Beel (water body) for a chance sighting of the rare and endangered White Winged Wood duck. Backtrack and divert to Korua Beel (about another 25 minutes walk), a point where one may have possibilities of sighting Gaur, Elephants, Flying squirrels and Deer. Today we offer our guests two different options, river rafting on the Jia Bhoreli River or a jungle walk in a nearby forest. We can go for a river rafting by rubber boats on the quiet and serene Jia Bhoreli River flowing through the Nameri national Park with great views of the forest and the not-so-distant mountains. This route is around 18 Kms and takes around 2-3 hrs. For those not going for rafting can opt for a guided walking safari in the Mekahi Mound to a rest point by the river back to our cottages. This walk is through scrubland and paddy fields. Beside the beautiful forest, the main attraction on this walk is the many birds that one can encounter during the walk. We will return to the camp for lunch. 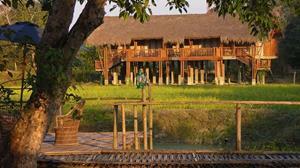 Post lunch, drive back to the Diphlu River Lodge in Kaziranga National Park. This evening we will relax in the lodge, discussing our day’s adventures. Dinner and overnight. After breakfast we will drive for about an hour to go to the old Silghat River Port by the mighty Brahmaputra River for a Dolphin Boat Safari. A motorized country boat will first take you to Hatimurah temple (10th Century AD) located on top of a hill. There after you will sail downstream in a country boat to Bhorelli - Brahmaputra river confluence to spot river Dolphins. After the boat ride we will drive a short distance to visit a tea estate where we will have our lunch. Brahmaputra River: Rare it is to find a reference to this river without the word “mighty’ attached to it, and this is exactly what you will feel when you take this boat safari on the river. It is an unique opportunity to spend half a day exploring the mighty Brahmaputra River using our own Country Boat and an opportunity to see the endangered ‘Gangetic Dolphins’, the National Aquatic Animal of India. After a leisurely breakfast we leave for the airport either in Guwahati or Jorhat to board a flight for onward journey.